SCOTTSBURG—At the height of the Cold War in the mid-1950s, Father Donald Buchanan was an officer in the U.S. Air Force serving on B-47 bombers armed with hydrogen bombs. “I carried the uranium core strapped to my leg all the time in case I had to bail out to protect it, because it was priceless,” he recalled of his service from 60 years ago. While surrounded by the height of U.S. military might and so close to armaments that could bring about unimaginable destruction, Father Buchanan concluded that God was calling him to serve not an earthly power but the kingdom of heaven as a priest. After completing four years of active duty in the Air Force, he became an archdiocesan seminarian and was ordained a priest on May 2, 1965. Now retired, he recently celebrated the 50th anniversary of his ordination at American Martyrs Parish in Scottsburg, near his hometown of Austin. Unlike many archdiocesan priests, Father Buchanan’s priestly life and ministry has not been centered on parishes. Instead, he has ministered in archdiocesan high schools and served as a full-time chaplain in correctional facilities and in the U.S. Navy. Father Buchanan had thought about the possibility of a call to the priesthood as an eighth grader “but pushed it aside.” When he later studied education at Indiana University in Bloomington, he also participated in the Reserve Officer Training Corps, which led to four years of active duty in the Air Force. His half century of widely varied priestly life and ministry, however, has fulfilled him in ways that no other path in life offered him. In the years immediately after his ordination, he served for periods at Father Thomas Scecina Memorial High School and Marian University, both in Indianapolis, Father Michael Shawe Jr./Sr. High School in Madison and the former Schulte High School in Terre Haute. 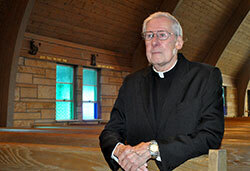 Michael Ellingsworth, a member of St. Benedict Parish in Terre Haute, first met Father Buchanan in 1967 when Ellingsworth was a senior at Schulte. At the time, Father Buchanan was beginning ministry as dean of boys at the school. “I saw him walking down the hallway, and I knew that he was new,” said Ellingsworth, 65. “So I went up to introduce myself to him. We formed a relationship from that point on. After seeking to give encouragement to young people in Catholic high schools, Father Buchanan did the same for many years in state correctional facilities in the archdiocese that housed teenage and young adult offenders. He created such a rapport with some of the inmates that, after some of them escaped detention, they had second thoughts and sought refuge in Catholic parishes. The priests serving there would call Father Buchanan, who then facilitated their return to prison. Looking back on his time in prison ministry, Father Buchanan appreciates the relationships that he was able to foster with some inmates. In 1985, Father Buchanan began 13 years of service as a chaplain in the U.S. Navy that took him to such places as Japan, Korea, Bahrain and Spain. In 1990, he began service at a Navy installation in the Philippines. A year later, his world was turned upside down when the island nation was wracked by the massive volcanic eruption of Mount Pinatubo and a typhoon that hit at the same time. Living conditions for him, the others stationed at the Navy base and the Filipinos surrounding it were made very challenging overnight. In the midst of such destruction and hardship, Father Buchanan helped distribute relief funds from the United States to Filipinos in need. He now looks back on his time of service in the Navy much like he does his time in schools and prisons. He retired from the Navy in 1998 and now lives in Austin. At age 82, he still provides sacramental assistance to parishes across central and southern Indiana.